In Maker’s Mark Distillery, Inc. v. Diageo North America, Inc., ___ F.3d. ___ (6th Cir. 2012), Marker’s Mark sued Jose Cuervo for trade dress infringement for including a red wax seal on its Reserva de la Familia tequila bottles. The Sixth Circuit affirmed the district court’s ruling that Maker’s Mark’s registered trademark consisting of a red dripping wax seal was infringed by Jose Cuervo. Maker’s Mark has used its distinctive red dripping wax trade dress since 1958. In 2001, Jose Cuervo decided to follow suit and began using a similar red dripping wax to accent its Reserva de la Famalia premium brand tequila. In 2003 Maker’s Mark sued Cuevro. After a bench trial, the district court found the red dripping wax of Maker’s Mark a valid trademark and held that Cuevero had infringed the trademark. On appeal, Jose Cuervo argued that the red dripping wax was “aesthetically functional” and therefore not protectable as a trademark. Cuervo appeals only the district court’s ruling as to aesthetic functionality, arguing that the red dripping wax seal is aesthetically functional, and therefore the mark is not enforceable. The Supreme Court has discussed the concept of aesthetic functionality in dicta, noting that “[i]t is proper to inquire into a significant non-reputation-related disadvantage in cases of [aesthetic] functionality.” TrafFix Devices, Inc. v. Marketing Displays, Inc., 532 U.S. 23, 33 (2001) (internal quotation marks omitted). We have interpreted this dicta to propose that, “where an aesthetic feature (like color), serves a significant function . . . courts should examine whether the exclusive use of that feature by one supplier would interfere with legitimate competition.” Antioch Co. v. W. Tramming Corp., 347 F.3d 150, 155 (6th Cir. 2003). The test for comparable alternatives asks whether trade-dress protection of certain features would nevertheless leave a variety of comparable alternative features that competitors may use to compete in the market. If such alternatives do not exist, the feature is functional; but if such alternatives do exist, then the feature is not functional . . . . The effective competition test asks . . . whether trade dress protection for a product’s feature would hinder the ability of another manufacturer to compete effectively in the market for the product. If such hindrance is probable, then the feature is functional and unsuitable for protection. If the feature is not a likely impediment to market competition, then the feature is nonfunctional and may receive trademark protection. The Court held that under either test Cuervo’s appeal failed. Regarding the “comparable alternatives” test, the court noted the district court’s finding that there is more than one way to seal a bottle with wax to make it look appealing. Regarding the “effective competition” test, the Court noted the District Court’s finding that “red wax is not the only pleasing color of wax.” The Court of Appeals held that the District Court’s findings were not clearly erroneous and therefore upheld the appeal. The name “bourbon” itself is easier to trace: one of the original nine counties of Kentucky was Bourbon County, WILLKIE, supra, at 20, named in honor of the French royal family. Charles K. Cowdery, How Bourbon Whiskey Really Got Its Famous Name, BOURBON COUNTRY READER, July 1996. “[Kentucky] whiskey was shipped from Limestone, a riverside port in Bourbon County,” down the Ohio river to the Mississippi, bound for New Orleans. REGAN &REGAN, supra, at 14. Whiskey shipped from the port in Bourbon County came to be known as “Old Bourbon,” and later, simply “Bourbon,” to distinguish it from Pennsylvania Rye or other whiskeys. Cowdery, How Bourbon Whiskey Really Got Its Famous Name, supra. The name “bourbon” at that time meant whiskey made from mostly corn in Kentucky or points west. But it was likely not until “sometime between 1823 and . . . 1845” that Dr. James Crow “perfect[ed] the sour-mash method of whiskey-making”—the dominant process in use today that, when coupled with aging in charred new oak barrels, produces modern bourbon’s familiar caramel color and distinctive taste. REGAN & REGAN, supra, at 15. 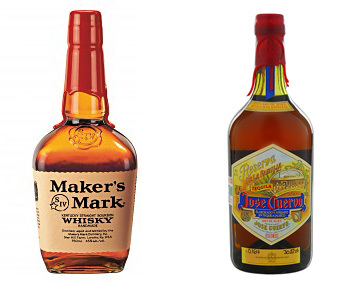 While in the early years “[w]hiskey was whiskey, as everybody knew,” some bourbon distillers began to brand their bourbons to capitalize on the differences between “[g]ood Kentucky Bourbon” and all the rest. WILLKIE, supra, at 22. Dr. Crow, a Kentuckian by way of Scotland, “insist[ed] upon strict sanitation in his manufacture,” and branded his bourbon with his name; other Kentucky families followed suit in an effort to differentiate their products. Id. Crow’s branding tactics seem to have worked, as his bourbon accumulated prominent fans. For example, bourbon drinker Ulysses S. Grant preferred Old Crow over other bourbons, Julia Reed, Bourbon’s Beauty, NEWSWEEK, Dec. 21, 2008, as did all three of Congress’s “Great Triumvirate,” Henry Clay, John C. Calhoun, and Daniel Webster. GERALD CARSON & MIKE VEACH, THE SOCIAL HISTORY OF BOURBON 47 (2010). The court, however, did not discuss the history of red wax used to seal liquor bottles, instead it focused on the reality of today’s liquor market where something once common is now uncommon and therefore protectable as a trademark.